If it was not for my love of steak, I could quite happily become a Pescatarian. I love the versatility, taste, texture and general goodness our fishy friends have to offer – one of my favourite seafood is prawn. They taste great, and good for you too. They can even improve sexual libido (apparently) – although I am not going there right now. Prawns have a great ability to defrost quickly in minutes, and absorb pretty much any flavour you throw at them making them a really versatile ingredient to use on a whim (just keep a few bags in the freezer for when you need them). This recipe makes an ideal starter (but could be fleshed out into a main with minimal effort), as it can be made in advance and chilled in the fridge 1-2 hours in advance. This is an adaptation of a Bill Granger recipe, featured in Bill’s Everyday Asian. I must have served it 3-4 times and is always a success (either that or my guests are just being polite, but seem to happily slurp up any I have left behind). Combine the chili dipping sauce, lime juice, and sesame oil in a small bowl (or ramekin) and mix well. I use a mini-whisk for this. 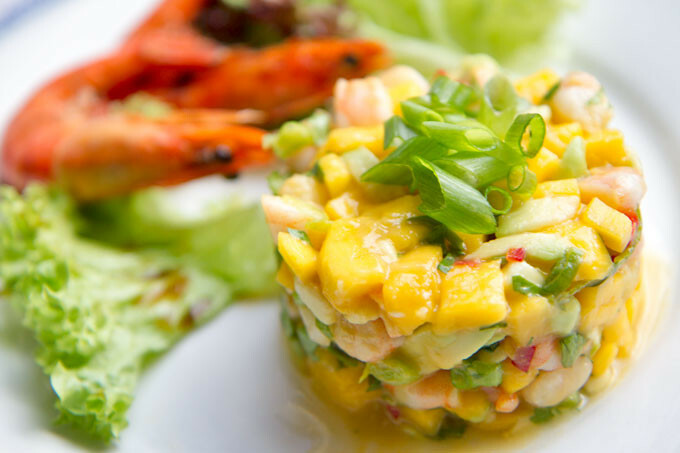 In a large mixing bowl, gently combine the finely chopped avocado, mango, chilli, spring onion and coriander. Drizzle over about half of the chilli and lime dressing, and mix well. Carefully place a quarter of the mixture into a chef’s ring, and gently compact using a pusher. Note: you do not want to crush or bruise the ingredients. Serve with shredded Pak Choi or romaine lettuce and drizzle over remaining dressing. It certainly ‘works’. I just need to find a better way of making the photo do justice. I have dusted off the SLR in the hope that I can produce better results.